Aluminium Bahrain B.S.C. (Alba), one of the leading aluminium smelters in the world, kicked-off the inaugural session of 2016 ‘Town Hall Meetings’ on January 14, 2016 at the Oasis Hall. Delivered by Alba’s Chief Executive Officer, Tim Murray, the 2016 ‘Town Hall Meetings’ will brief all employees about the Company’s performance in 2015 along with the expectations for 2016. 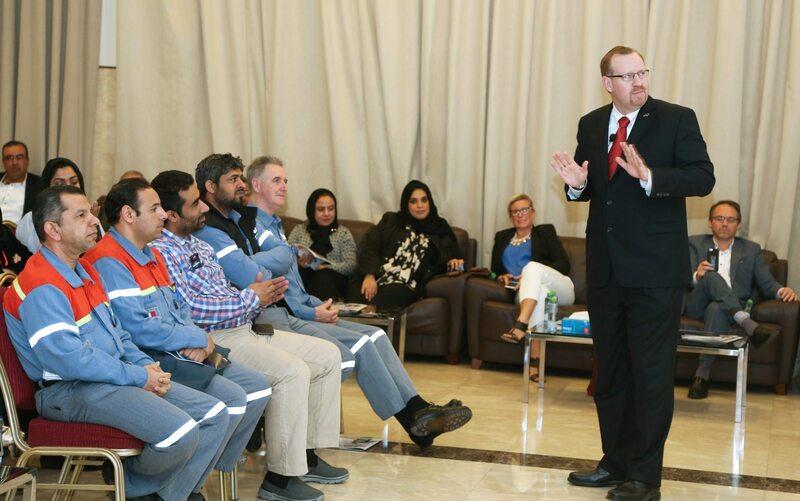 The ‘Town Hall Meeting’ was a special initiative introduced by Murray in January 2014 to update employees on Alba’s performance and goals through presentations and interactive sessions. “The Town Hall Meetings have become a tradition in our Company as a platform that provides a direct means of communication with our employees. Alba had a remarkable 2015 on many fronts namely in terms of Operational and Safety performance with record production figures topping more than 960,643 metric tonnes. I thank the Alba Board, Management, Alba Labour Union, Alba Trade Union, and all the employees and contractors for this success. The 2016 ‘Town Hall Meetings’ will be held until January 21, 2016 for all departments and highlight various areas including safety achievements, operational performance, readiness to do more than necessary and expectations for 2016.